This function can be accessed via main menu > File > Export Map. Use this command to save map in format other than Mapwel's native MPW format if you need to process data in other software. 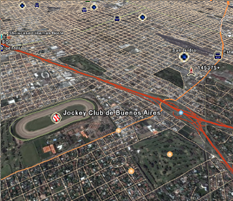 Mapwel currently supports data export into Garmin IMG, Google Earth KML and cGPSmapper MP formats. Mapwel Advanced license is needed to use export function. It is not available in Mapwel Basic. Maps exported into this format can be open in Google Earth and displayed on top of the earth surface. When you create your own map, it is very useful to use this function to check accuracy of the map. If the 'terrain' option in Google Earth is set, map is displayed so that it follows the terrain and it looks like 3D map. Map exported from Mapwel software in KML format and loaded into Google Earth. Map contains polygons, polylines and symbols. POIs are exported with address info (if supplied). 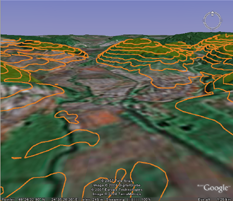 Left: contour lines from Mapwel displayed 3D with 'Terrain' option in Google Earth. left: map from Mapwel displayed on top of the satellite image in Google Earth. Map exported into KML format and displayed in Google Earth. IMG is native binary format of Garmin GPS units. These files can be loaded into Garmin GPS with our freeware MapUpload (included with Mapwel installation files) or with 3rd party upload software. 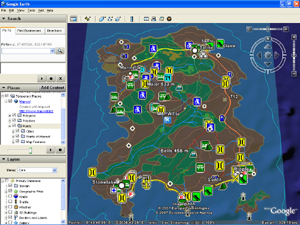 Mapwel software (both Basic and Advanced) allows to load maps directly into the GPS. If you prefer to use other uploading method, please note that Garmin GPS units with files 'visible' from PC require all maps to be merged into a single IMG files with name GMAPSUPP.IMG. To define irregular shape of map, use the 'Background Area' polygon object in Mapwel. Please note that map can contain only 1 object of this type and all other object must lie within its boundaries. If 'Background Area' is used, GPS does not display objects outside of this polygon.